Holidays Greetings from 1,000 Light Years Away! Astronomers have come across a new image from NASA's Wide-field Infrared Survey Explorer, or WISE, that resembles a wreath. The green ring (evergreen) is made of tiny particles of warm dust whose composition is very similar to smog found here on Earth. 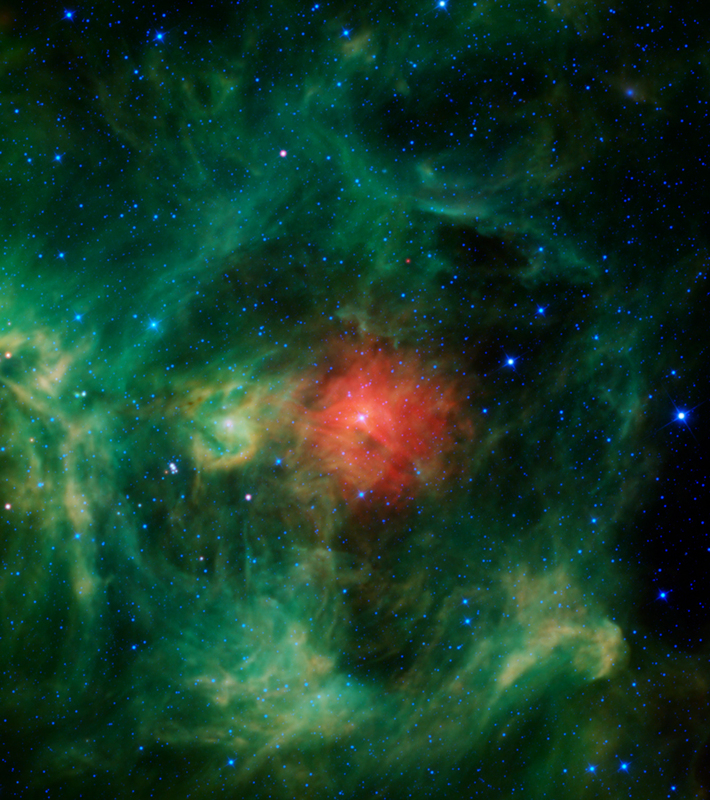 The red cloud (bow) in the middle is probably made of dust that is more metallic and cooler than the surrounding regions. The bright star in the middle of the red cloud, called HD 278942, is so luminous that it is likely what is causing most of the surrounding ring to glow. In fact its powerful stellar winds are what cleared out the surrounding warm dust and created the ring-shaped feature in the first place. The bright greenish-yellow region left of center (holly) is similar to the ring, though more dense. The bluish-white stars (silver bells) scattered throughout are stars located both in front of, and behind, the nebula. Regions similar to the "Wreath nebula" are found near the band of the Milky Way in the night sky. The wreath is slightly off of this band, near the boundary between the constellations of Perseus and Taurus, but at a relatively close distance of only about 1,000 light-years, the cloud is a still part of our Milky Way galaxy.